Planning a pregnancy is one of the most sensible things to do, and it has a big impact on the health of your baby. Pregnancy is a time for growth and additional demand for nutrients. It is the biggest change in a woman's life. A mother's body should be healthy to nurture a new life. It is a big responsibility, and one should be ready to accept it as a challenge and also enjoy this period of change in your life. A woman who has been well nourished before conception begins her pregnancy with reserves of several essential nutrients like Protein, Vitamins ( Vitamin A, Vitamin C & Vitamin E, Pregnancy Folic Acid), minerals ( Iron and Calcium), to meet the needs of the growing foetus. It is important to build up reserves of these nutrients before you actually conceive to have a safe and healthy pregnancy. 3. Have a complete medical checkup, including blood analysis, which will indicate your iron, haemoglobin and folic acid status. These nutrients are vital during your pregnancy and are required in large quantities for the foetal growth and development. It is important that you build up their reserves before you actually conceive. Iron is essential for foetal blood formation, Calcium is necessary for the building of healthy bones and teeth and Folic acid is vital for the development of the fetal neural tubes during the first trimester. So eat foods that are rich in folic acid much before you conceive and throughout your pregnancy as it is one of the most needed vitamins required by your body during this time. Keeping these requirements in mind, we have included recipes like Hariyali Dal and Soya Upma to nourish you as they are excellent sources of all these nutrients. 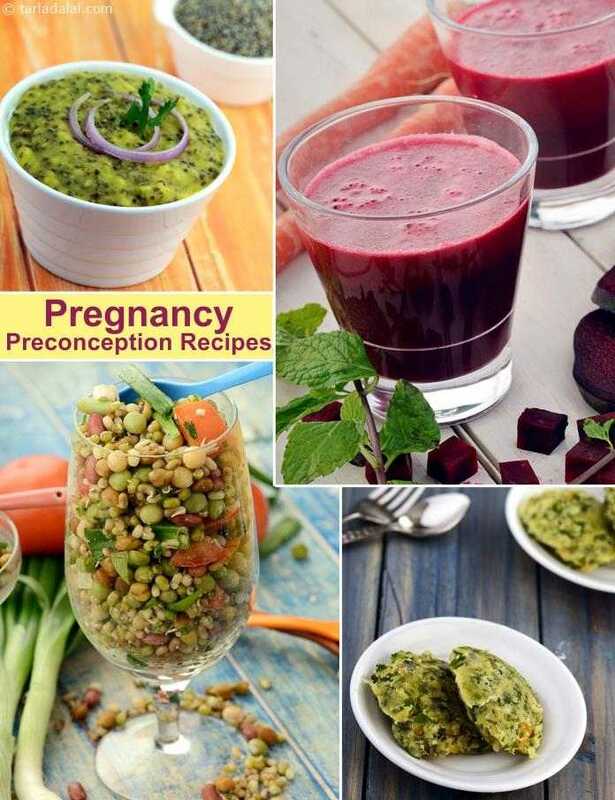 Thanks for the great detail on preconception and giving recipes Rich in Calcium, Iron, Folic Acid and Fibre.